During London Fashion Week I decided to take a little fashunnnn time out go to the launch of Matthew Williamson’s latest collection of fabrics and wallpapers for Osborne and Little. As I'm currently refurbishing my flat, I'm on the constant lookout for design inspiration - and what better place to start? Matthew’s signature love of kaleidoscopic prints and his penchant for the exotic has been reflected in this collection of spirited, fruity fabrics and wild and whimsical wallpapers. If you’re not currently looking to update your home with any crouching tigers, or not so hidden peacocks (and and I must ask, why not?!) 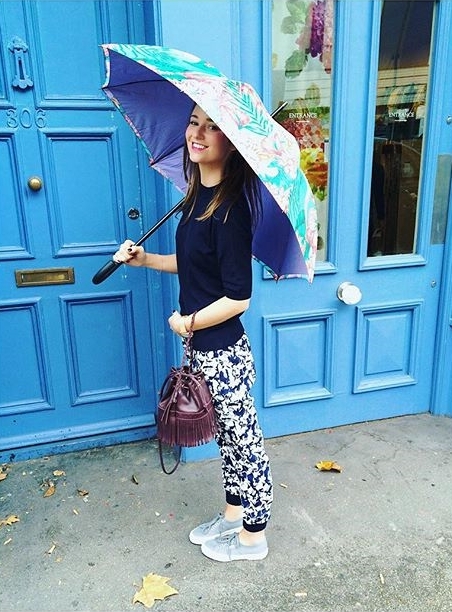 I suggest you get yourself a FANTASTICAL Matthew Williamson for Osborne and Little umbrella. I couldn’t have been more thrilled with mine on that day (my Clo and Flo blow dry was saved - Phew!!) and I can already foresee that my latest, fabulously flamboyant accessory will fast become my most useful! See the full Matthew Williamson for Osborne and Little range HERE.